Hi all, well it’s been another great month and the weather seems to be behaving a majority of the time, with a few runs of 3-4 days consecutively nice. On the fishing side the snapper have been a good way to start the day and put some nice fish in the box along with sweetlip that just love those slower floating baits. One of the most consistent fish on the chew have been parrot and some great quality with many around the 2-3kg and a few over. 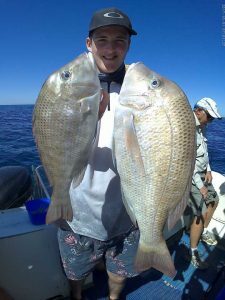 The bite was a little slow on the back of the moon and a strong current made things difficult to fish grounds we would have liked, so a few trips found us searching around closer grounds which produced pearl perch, Moses perch, snapper, sweetlip, cod, cobia and jew. Out a little wider parrot, husser, Gold Spot wrass, reds.